Every year, 2.7 million people die as a result of ambient, or outdoor, pollution. An even more astonishing fact is that close to double that number die from indoor air pollution. This tragedy is the foundation of Emory University Professor Eri Saikawa’s research. I had the pleasure of interviewing her recently to discuss her work. 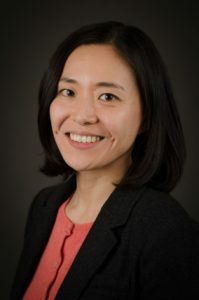 Professor Saikawa originally started her career as a modeler, studying the relationship between pollution and ambient emissions. When she learned that negative effects from indoor pollution are much worse than ambient, she wanted to explore it herself. 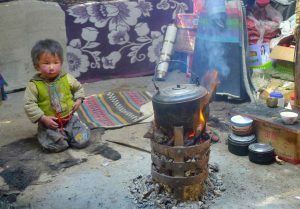 She began a research project to study the impact of burning yak dung as a fuel for heating and cooking in Tibetan households. Have you ever thought of culture as being an integral part of scientific research? It is what makes her work “interesting but challenging,” Saikawa says. This study produced fascinating scientific results, and it also revealed a different side of science and the impact that culture can have. Science showed that purchasing chimneys, using alternative fuel sources, and improving ventilation would all help to decrease harmful indoor emissions in Tibetan households, but no one wanted to do it. Why? Culture. Tibetans have been using yak dung as a fuel source for generations. Saikawa described that many families were aware of pollution within their homes but were not worried about the health impacts. People often relate ambient pollution to its contribution to climate change, and Tibetans are very worried about climate change. There is a snowy mountain peak that the Tibetan people consider holy. They watch fearfully as the snow recedes further each year and disappears. However, indoor pollution is a more serious and immediate issue for them than climate change. It is a problem of human health, and as a result should receive very different attention. Professor Saikawa described how one of her biggest challenges was getting the Tibetans to “perceive the environmental risk and see it as a problem.” Unlike the very visible cue of the mountain losing its snow, the impacts of indoor air pollution are not as easy for people to recognize as a problem. In general, healthcare is not well promoted. When Professor Saikawa visited Tibet, she noted that the nearest healthcare facility was an hour drive from the rural villages. The people did not view it necessary to spend their time going to get healthcare. The health risk caused by breathing in emissions from burning yak dung in their homes without proper exhausts and ventilation is immediate. In other countries having similar indoor air quality problems, scientists went in with fancy chimney and stoves but they have gone unused. People simply continued in the same ways they always had. In addition to overseeing the research, Professor Saikawa has to balance her personal views of the situation with how Tibetans think and act. The difficulty resides in how much responsibility we have over the situation. It is important to protect people from negatives health effects while still respecting their culture. In situations like these, it is not enough to rely on the science of the issue. Saikawa described this as one of the main problems facing the scientific community. She described her experience in Tibet as very positive and eye opening to their way of life and how “you can only understand how people live by going through what they do.” A good lesson for all of us!